About a quarter of American adults (24 percent) say they have eaten less this year to ensure their children have enough food, a startling expression of parents’ caring for their children that also sheds light on a the problem of hunger in America. Almost one in 10 (8 percent) Americans say they have gone to bed hungry at least once in the past year due to lack of money for food. According to The 2009 Hormel Hunger Survey, released today by Hormel Foods Corporation (NYSE: HRL), not being able to feed one’s family is among the most distressing circumstances Americans can face—on par with spending a night in jail—and far more distressing than getting fired from a job. In the survey, 82 percent said they would be highly upset, uncomfortable or embarrassed if they were not able to provide enough food for their family, compared with 83 percent who felt that way about spending a night in jail and 59 percent who cited those feelings in regard to getting fired from a job. If they did find themselves in a position where they were unable to buy enough food for themselves or their family, nearly four in 10 (38 percent) Americans said they would be very uncomfortable asking for food donations. The group most distressed about not being able to provide enough food for one’s family was the 18-44 year range, generally those most likely to have young children. In this, the fourth annual Hormel Foods study on Americans’ experiences with and views on hunger, more than half (52 percent) of Americans said they personally know someone who has received food from a food bank or shelter this year. In addition, about one in 10 (11 percent) say someone in their household has received food from a food bank or shelter and 16 percent think it is at least somewhat likely someone in their immediate family will need food assistance in the next year. Those who have been forced to seek food donations were most likely (51 percent) to say the reason was unemployment. More than two-thirds (69 percent) of Americans believe the problem of hunger has increased in the United States during the past year, and women are more likely than men to have this sentiment (76 percent vs. 61 percent). In addition, nearly nine out of 10 (87 percent) are concerned about hunger in the United States, including nearly half (46 percent) who are very concerned about it. To help combat the problem of hunger in the United States, most people have donated both food (75 percent) and money (61 percent), and three in 10 have done volunteer work. The majority (80 percent) agree it is not hopeless to try to help eradicate hunger around the world and nearly two-thirds (65 percent) at least somewhat agree that Americans have a responsibility to help people in other countries who do not have enough food to eat. “We are encouraged to learn that, despite troubling statistics about the number of hungry people around the globe, most Americans still believe that by working together, we can help end the problem of hunger,” said Craven. -A great majority of Americans (92 percent) at least somewhat agree that children should receive hunger relief first, no matter where they live. -A great majority of Americans (92 percent) at least somewhat agree that, despite the recession in the United States, many people around the world are much worse off than Americans are. As part of Hormel Foods’ commitment to hunger causes, the company made cash, in-kind and equipment donations totaling $3.9 million, and donated 81,000 pounds of protein, providing charitable meals for 430,000 people last year. For more information see the 2009 Hormel Hunger Survey Key Findings. The 2009 Hormel Hunger Survey was a telephone survey conducted Oct. 9-12, 2009 by Opinion Research Corp. The random sample included 1,003 American adults and the margin of sampling error is +/- 3 percentage points at the 95 percent confidence level. Hormel Foods acknowledges Jean Kinsey, a professor of applied economics at the University of Minnesota, and director of The Food Industry Center, for her input. 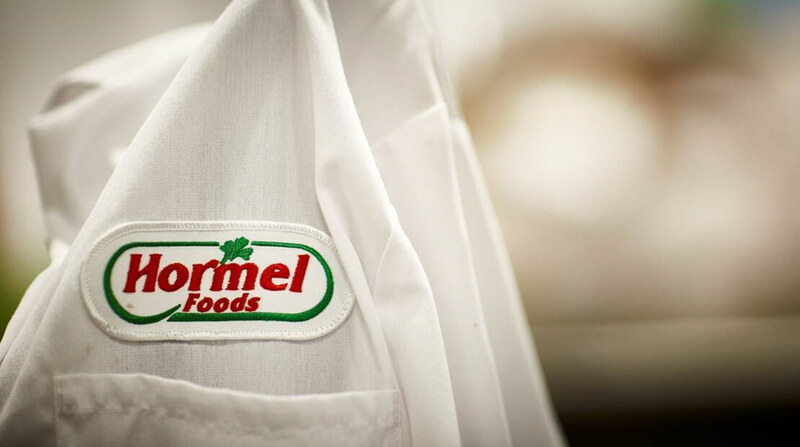 Hormel Foods Continues Reductions in Product Packaging Following its reduction of 5.2 million pounds of product packaging in 2008, Hormel Foods announced the results of several new packaging projects.